This story start came from seeing one of Lily the Little Black Dog’s many chew toys. Like many of her toys, past and present, they seem to lose eyes, limbs, stuffing, and other parts. It’s also one of my few attempts of writing in the first person. The usual disclaimer: no editing was done to this article, so expect typos and such. The bunny, one of Roxy’s chew toys, was on my desk to my left, near the edge. I hadn’t noticed, nor did I think I heard something. 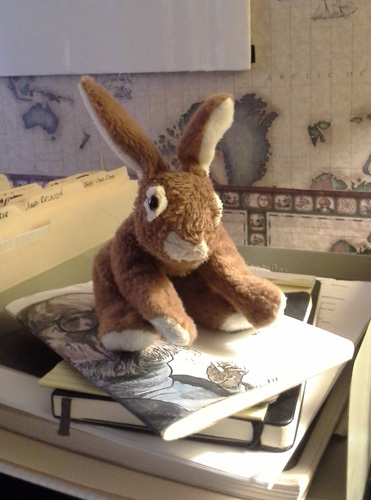 But it did seem odd, not the talking, the bunny being on my desk. Well, the talking was weird too. I stared at the bunny. Then at my coffee. It was early. It was only on my first cup, so it wasn’t the caffeine. What did I eat last night? Had some Sugar Pops and Cheetos while watching reruns of Lost, but that never caused any problems before. I looked at the bunny. It was in a sitting position, hunched back. It’s disproportionately long ears standing straight up. A talking rabbit. Why not? Weirder things have happened in my life. A short review of All I Did Was Shoot My Man by Walter Mosley, featuring his character, private investigator Leonid McGill. Ephrata PA Police Department announced this week that they will be getting a more sophisticated flying drone to spy on the small town in northern Lancaster County, Pennsylvania. Season 3 of Netflix’s excellent sci-fi time travel drama #Travelers returned this week. Time to binge television again. Magic Dance’s New Eyes is simply deja vu all over again: Eighties teen movie guitar and synth rock revisited and made fresh 40 years later. Recommended.